Philip Lindsley (1786 ñ 1855) was an American Presbyterian minister and educator. He served as the acting president of the College of New Jersey (now Princeton University) from 1822 to 1824, and as the first president of the University of Nashville (formally Cumberland College) from 1824 to 1850. 11 items, nine Nashville imprints and two New Jersey imprints. 1) An Address Delivered in Nashville, January 12, 1825, At the Inauguration of the President of Cumberland College. Nashville Norvell 1825. 48pp. Tied string binding 2) Baccalaureate Address, Pronounced on the Evening of the Anniversary Commencement of the University of Nashville, October 3, 1827. Nashville: Simpson, 1827 30 pp. wrapped later in marbled pages. 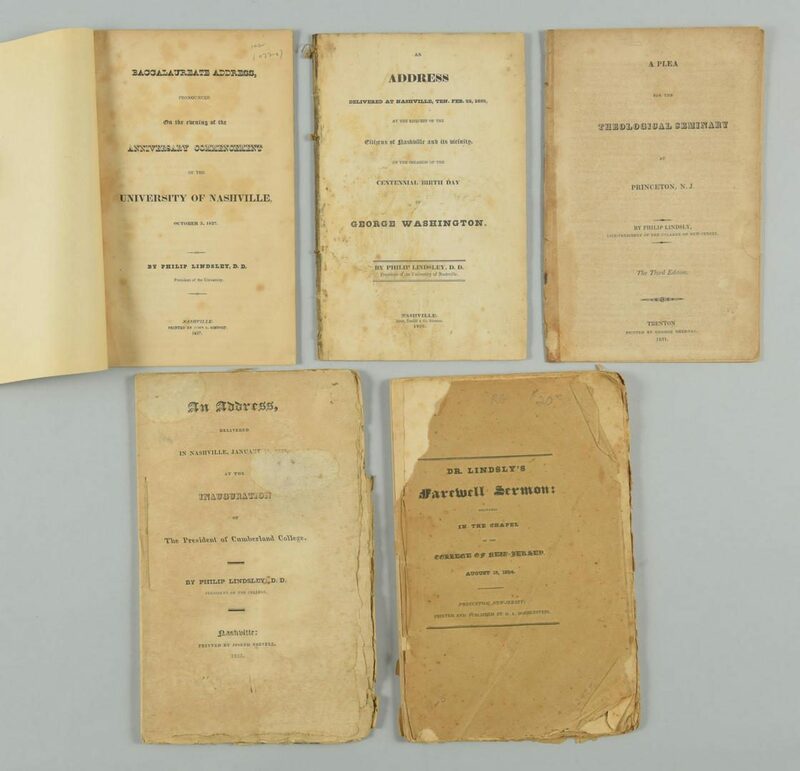 3) 4) and 5) THREE copies, all disbound from larger volumes of Baccalaureate Address, Pronounced on the Sixth Anniversary Commencement of the University of Nashville, October 5, 1831. Nashville Herald Office, 1831. 40 pp. 6) An Address Delivered at Nashville, Ten. Feb. 22, 1832, at the request of the Citizens of Nashville and its Vicinity, on the occasion of the Centennial Birth Day of George Washington. Nashville: Hunt, Tardiff, & Printers, 1832. 36pp. 7) Baccalaureate Address, Pronounced on the Seventh Anniversary Commencement of the University of Nashville, October 3, 1832. Nashville: Hunt, Tardiff & Co. 1932 disbound from larger volume. 8) Baccalaureate Address, Pronounced on the Seventh Anniversary Commencement of the University of Nashville, October 3, 1832. Nashville: Hunt, Tardiff & Co. 1932. 66pp. disbound from larger volume. 9) A Discourse Delivered at the Installation of the Rev. John T. Edgar, as Pastor of the Presbyterian Church in Nashville, December 25th, 1833. Nashville: W. Hasell Hunt, 1834. 56pp. disbound from larger volume. 10) A Plea for the Theological Seminary at Princeton, N.J. The Third Edition. Trenton: George Sherman, 1821 32 pp. String tied folded pages. 11) Dr. Lindsly's Farewell Sermon: Delivered in the Chapel of the College of New Jersey, August 15 1824. Princeton: D. A. Borrenstein, 1824. 1pp. advertising, 52pp. Books range in size from 8" H x 5 1/8" W x 1/16" D to 9 1/4" H x 5 3/4" W x 1/4" D. Collection of Charles and Ann Wells, Nashville, Tennessee. CONDITION: Pamphlets are in fair to very good condition. 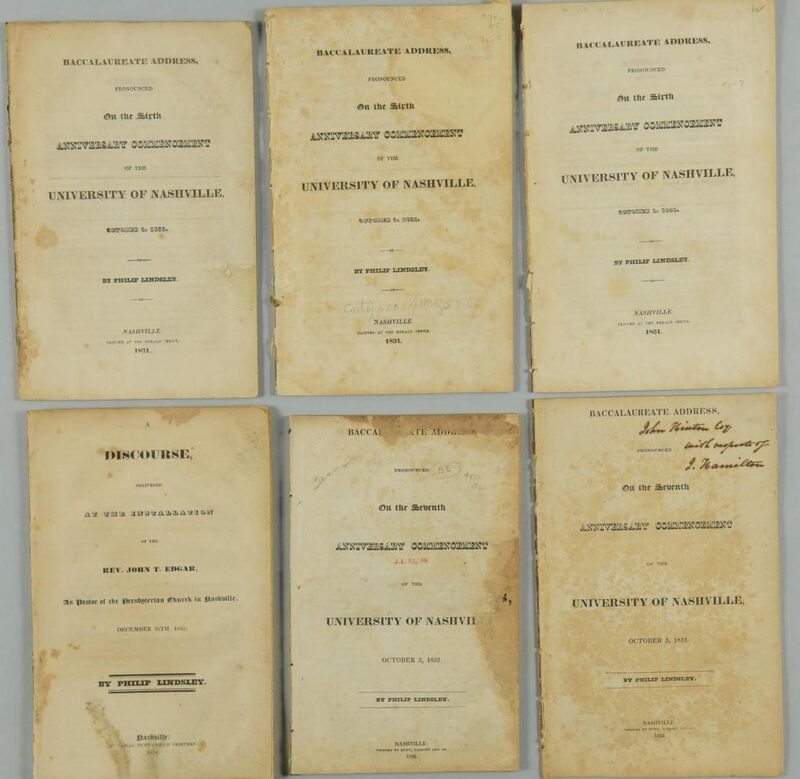 One copy of Sixth Anniversary Commencement of the University of Nashville, October 5, 1831 a little soiled. Centennial Birth Day of George Washington some soiling. one of the copies of the Seventh Anniversary Commencement of the University of Nashville, October 3, 1832 is incomplete having only 20 pages. The other is complete. Dr. Lindsly's Farewell Sermon: paper wraps present but badly chipped and detached.